Chicago Park District Supt. Mike Kelly visited Ald. Leslie Hairston's 5th Ward meeting Tuesday night to answer questions about merging the South Shore and Jackson Park golf courses. 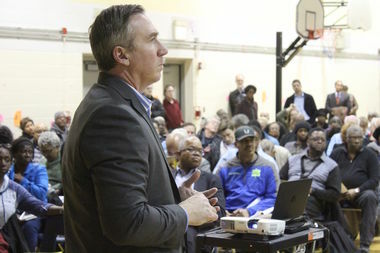 SOUTH SHORE — Plans for merging the Jackson Park and South Shore golf courses faced a much more agreeable audience Tuesday night as details begin to crystallize. Chicago Park District Supt. Mike Kelly was at Ald. Leslie Hairston’s 5th Ward meeting at the South Shore Fine Arts Academy, 1415 E. 70th St., to answer questions about the proposal. The plan calls for the two golf courses to be combined into one PGA-level course designed by Tiger Woods’ design company. Kelly answered questions for an hour and revealed that plans were already starting to be fleshed out as engineers prepare to do the land surveys and other work that is required before designs can be drawn. 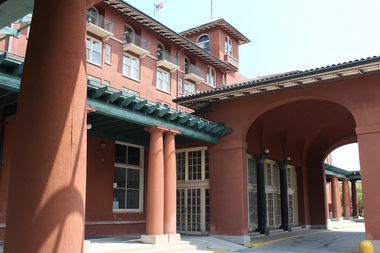 He said the South Shore Cultural Center, 7059 S. South Shore Drive, will get updates, but won’t be part of the golf course. The South Shore Cultural Center will not play a role in the day-to-day operations of a redesigned golf course, Chicago Park District Supt. Mike Kelly said Tuesday. Kelly said the stables and parking lots will be included in the engineering work, but the cultural center won’t play a role in the day-to-day operations of the golf course unless the community requests it. He said raising $5 million to $10 million to begin work in the spring on the South Shore section of the course will be the next major hurdle. “We’ve got momentum with the donors,” Kelly said. Estimated costs for the golf course have ranged up to $30 million, but could be more depending on the cost to repair revetments along the shoreline. That work would require help from the U.S. Army Corps of Engineers, which could slow down the planning. Kelly said after the meeting that a new clubhouse would need to be built and it’s unclear where in the park it would go. Kelly faced sharp questions during a meeting with the Jackson Park Advisory Council, the first public meeting about the proposal called just two days before a Jan. 11 Park District vote on the first $1.1 million contract for the initial design work. Hairston started the meeting saying she would form an advisory committee to make sure the community continues to have input on the golf course work, which is expected to start as early as the spring. The audience offered qualified support to the plan if prices are kept affordable to local golfers, youth programs remain and the community continues to get input as the design is developed.